When athletes are ‘on the DL,’ or disabled list, they cannot play due to injury. In the film ‘Coming Off The DL,’ the meaning of ‘disabled list’ changes, but the feeling of exclusion remains. For Frank Kineavy and Nick Gaynor, two students with cerebral palsy who work as managers of the Villanova University men’s and women’s basketball teams, the DL represents the limitations and challenges they face every day because of society’s misguided assumptions about their disability. 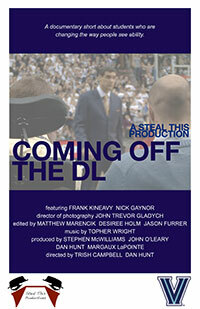 ‘Coming Off The DL’ shows hows Frank and Nick are overcoming the physical, academic, and social challenges of cerebral palsy and changing the way people see ability.